Two months later, the events surrounding the fire in Master Sgt. Lonnie McBride’s Northern Virginia condo building still seem surreal. The Air Force reservist nearly ignored the faint wisps of white smoke in the breezeway and the far-off sound of an alarm early on the morning of May 19. It was 6:30 a.m., and McBride had a 9 a.m. meeting to get to in Delaware, a two-hour drive away. Someone had probably just burnt their breakfast, he figured as he continued from his third-floor condo to his car at the bottom of the stairwell. But as McBride tossed his bags in the backseat, he felt the urge to go find the source of the smoke. “It sounds strange, but it’s the God’s honest truth. I had this incredibly strange feeling that something’s not right,” he said in a July 28 interview with Air Force Times. By the time the ordeal was over, the fire had ravaged at least one condo and heavy, black smoke had trapped eight people on the third floor. Those and nine others ultimately escaped without serious injury, either roused from their beds by McBride’s incessant banging and shouting or evacuated from balconies by firefighters he’d summoned with a call to 911. 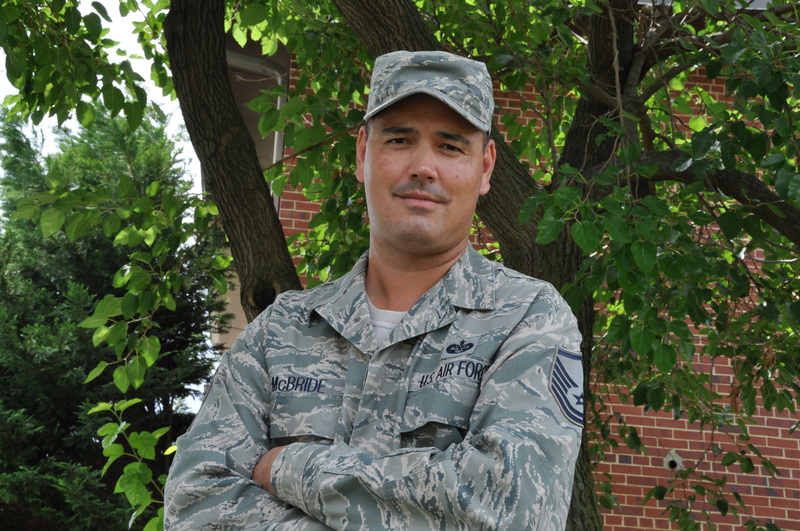 McBride works as a civilian software consultant when he is not serving as a law office superintendent for the 459th Air Refueling Wing at Joint Base Andrews, Maryland. Most weekdays, he telecommutes or is away from home on travel. Which makes him wonder what would have happened if there was no meeting that morning. Or if he had brushed the smoke off as somebody’s overdone toast. “If that fire wasn’t noticed, I think everybody knows what would have happened,” McBride said. After leaving his bags in the car, the master sergeant went floor by floor searching for another sign of the smoke. It was only on his way back down that McBride saw it again — this time billowing in the second floor breezeway. He followed it to a condo where he knew a young couple was living and banged on the door until he finally got a response. The woman who lived there had apparently fallen asleep on the couch after bidding her husband goodbye that morning, McBride said. His knocking — not the smoke or the heat — awakened her. He next called 911, then began knocking on all the other condo doors. By the time he got back to the third floor, the smoke in the breezeway was too black and heavy to go any further. McBride did the only thing he could do: he moved his car to make way for the fire department and waited. His actions that morning were instinctual and methodical, which McBride attributes to his years in the Air Force.